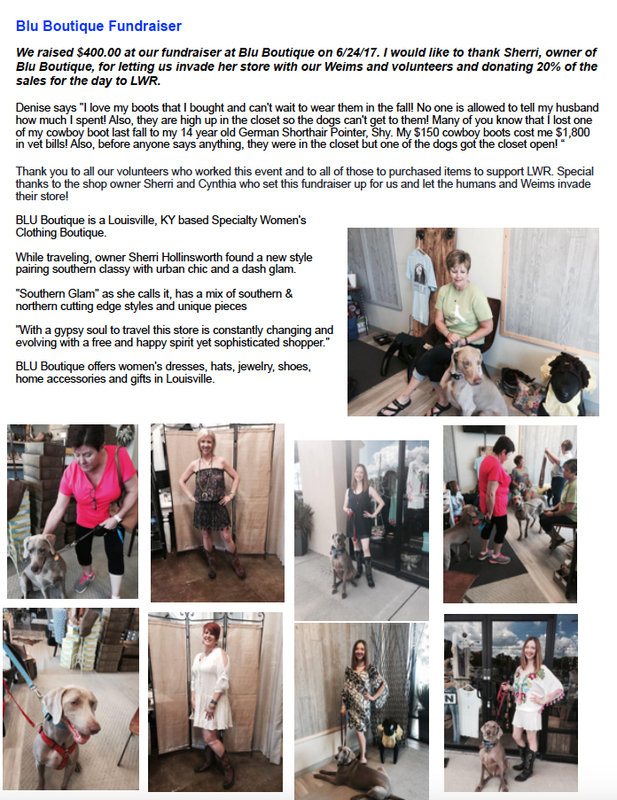 AVAILABLE WEIMS | Louisville Weimaraner Rescue Inc.
Hi Iâm Ford! Now just because you may not like Fords, donât let my name stop you from reading more about me! I am a 3-year-old, gray Weimaraner. I am a pretty laidback guy. I love my toys, especially tennis balls. The more tennis balls the better. I love playing ball and tug with my foster family. I grew up as the only dog in the household so playing with other dogs has been a little strange. I will play with my 4-legged foster brother and sister, but my favorite playmates are my foster Mom and Dad. I get along with all my foster siblings including the two things they call cats and the funny looking things called chickens. I have even met the sheep and horses across the road. They did not seem to be bothered with me or me with them. Sometimes my foster brother plays too rough or has a toy that I want, and I will become a little bossy. Mom or Dad will make me settle down. I do like to talk a lot. If I hear strange things outside, I must alert the family. If my brother has a toy I want, I bark at him until he gives it up. I have heard I can be a little bratty, but I have been the only child, so I am having some issues adjusting to sharing. Because I do like to talk a lot an apartment setting would probably not be the best for me. I am living in the country now and I go out and play in the yard off lead. I love to run with my foster brother chasing me. I am a Velcro dog, so I never stray too far from my foster Mom and Dad. If I do wonder off too far, I come back when called. I have been left to free roam in the house for 8 hours with no issues. I was crate trained when I was young. At my foster home I have showed no interest in the crate. I sleep at night in my bed. After breakfast I will sneak up into the human bed and Mom lets me slip in under the covers. As you can tell by my profile picture, I am a lean machine. Unfortunately, my original Dad had to give me up to LWR due to health issues. I am up to date on vaccinations, neutered, heartworm negative and started on preventative, along with being microchipped. I am being fostered in Madison, IN. If you are interested in this Weim, please visit www.louisvilleweimrescue.com and fill out an adoption application. Please understand that we are all volunteers and have jobs outside of the rescue, etc. Once we receive your application and know that you are serious about adopting one of our Weimaraners an adoption coordinator will contact you. Also, foster homes are always in need for Weimaraners in our rescue. If you are interested in fostering, please visit www.louisvilleweimrescue.com and complete a foster application. Hello, my name is Slim or at least thatâs what they are calling me. I was surrendered to a shelter because my family couldnât feed me anymore. I wasnât taken care of very well before arriving at the shelter, but I donât want to think about that anymore. Since I have come to Louisville Weimaraner Rescue, I have gained a little weight. The vet said that I am a healthy boy, but I need to gain a few more pounds. They think I am about 8 years young, but I donât know what that means. What I do know is that I just want to be close to anyone that likes to cuddle. My foster home is great, and I love being here. It is warm, there is always fresh wate soft beds, and blankets on the floor. I do well in the house and totally housebroken. My foster 4-legged brother and sister have been really nice to share their things and my foster Mom and Dad really thinks I am handsome. They give me treats when I sit and shake paws with them. I overheard them say that I am super sweet and gentle, and when we walk around the neighborhood, they have commented how good I am on the leash. There are some chickens in the back yard. I think they are goofy, and I leave them alone. Car rides get me real excited! My foster family have had some friends stop by to visit and I really like meeting them. I am neutered, up to date on vaccinations, heartworm negative and started on prevention along with being microchipped. I hope to meet you soon. Sincerely -Slim If you are interested in this Weim, please visit www.louisvilleweimrescue.com and fill out an adoption application. Please understand that we are all volunteers and have jobs outside of the rescue, etc. Once we receive your application and know that you are serious about adopting one of our Weimaraners an adoption coordinator will contact you. Also, foster homes are always in need for Weimaraners in our rescue. 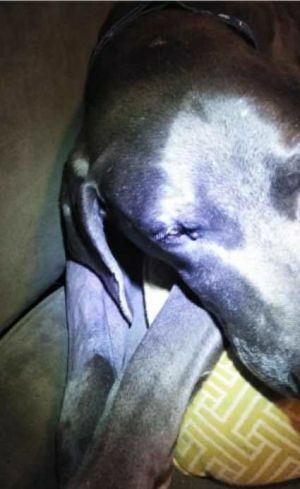 If you are interested in fostering, please visit www.louisvilleweimrescue.com and complete a foster application.If you are interested in this Weim, please visit www.louisvilleweimrescue.com and fill out an adoption application. Please understand that we are all volunteers and have jobs outside of the rescue, etc. Once we receive your application and know that you are serious about adopting one of our Weimaraners an adoption coordinator will contact you. Also, foster homes are always in need for Weimaraners in our rescue. If you are interested in fostering, please visit www.louisvilleweimrescue.com and complete a foster application. Hello! My name is Duke. 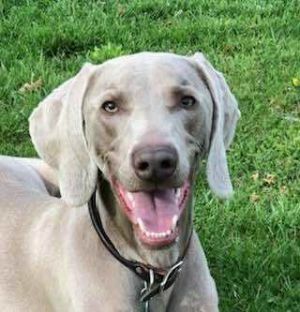 I am a 8-year-old, 60# Weimaraner currently living in Lexington, KY. I am a sweet and loving boy, but my previous owner gave me up after an unfortunate accident. I lost my left hind leg and now I am getting used to being a âtri-podâ. I get along fine with pretty much everyone (not too sure about those things called âcatsââ¦I have heard of them but never seen one up close). This is my second foster home, as my first one had another dog that did not like me. I had a pretty good cut on my ear, but that is all healed up now. I get along great with my foster Dadâs female weim. I currently do not do too well with stairs, so I will need a house that is all on one floor. This may change in the future as I get used to not having my back leg. My foster dad bought me a ramp for the steps to the back yard. Cool! I have a foster Weim sister and we play and have fun outside. I do well at walking time too. I can be crated or loose in the house. I canât really jump up to get anything due to my condition. Thatâs a plus, right? No counter surfing for me! Oh, I love being around people! My foster dad says that I am an âold soulâ? Iâm not sure what that means, but I do enjoy a good nap and I sleep all night. Dad has been giving me vitamins and some yummy treats with stuff for my hips in them. I donât know what they are, but they taste GREAT! Dad also has been letting me sleep on his bed, but I will sleep on my dog bed if I need to. Your bed is much more comfy! I seem to be good with kids as well, as I liked the 8- and 10-year-old kids I was around, but I am a big boy, so smaller children might get roughed up a bit, but not on purpose. I am neutered, current on all my vaccinations, along with heart worm and flea stuff. As you have read, I have been in two homes now, and I really would like to find my fur-ever home. Will you be the one to give me that! I could use the love and attention. If you are interested in this Weim, please visit www.louisvilleweimrescue.com and fill out an adoption application. Please understand that we are all volunteers and have jobs outside of the rescue, etc. Once we receive your application and know that you are serious about adopting one of our Weimaraners an adoption coordinator will contact you. Also, foster homes are always in need for Weimaraners in our rescue. If you are interested in fostering, please visit www.louisvilleweimrescue.com and complete a foster application.